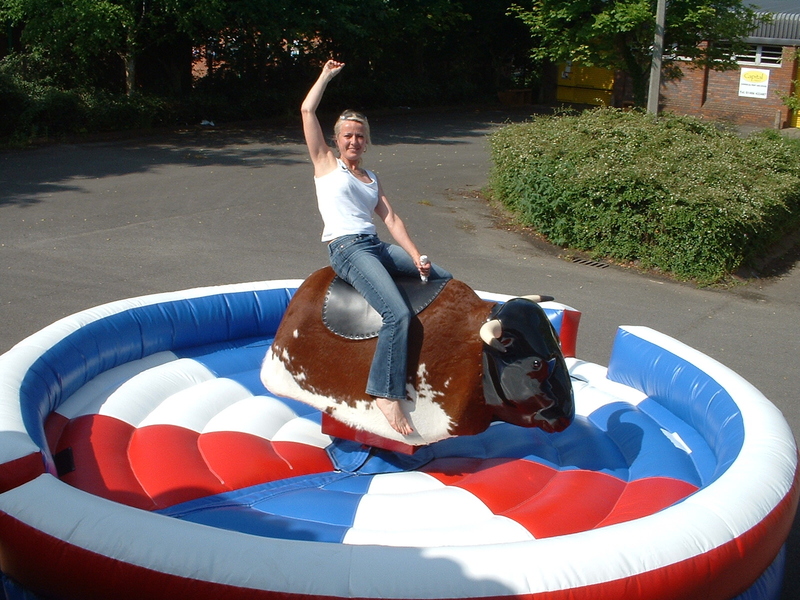 Hire our fantastic Rodeo Bull, known by some as a Bucking Bronco and provide as much amusement for the spectators as it will for the rider. As he or she tries to stay on the bucking, spinning bull as long as they can The Rodeo Bull’s that you hire from us are the latest and best models on the market and our expert staff will deliver, set it up, and operate it for you, we are all very experienced and know how to keep people entertained with these machines ensuring that your event goes as you would like it to, The bulls themselves come with red flashing eyes and real cow hide and a leather saddle. There is also a competition mode so that each rider receives an identical ride, there are timers on the controller so you can see who stays on the longest of the compertition. So why not have your very own rodeo competition Today! Our Rodeo Bull is always supplied with an experienced ride operator, who will run the ride on your behalf for the time you require and will supervise for the whole event. The speed of the rodeo bull is controlled at the discretion of the ride operator which makes this ride suitable for both adults and children. Can be staged indoors/outdoors to suit your requirements subject to weather conditions, type of ground and venue. We can supply a generator which is ideal for outdoor events or the hirer can supply their own electricity (indoor events). We will require a minimum set up time of 1 hour. We provide a Nationwide Service 7 days a week, hire can be on a daily basis, weekend or longer term basis (please ask for our special rates). Our fees are very competitive and are fully inclusive £1 million Public Liability Insurance and can provide a copy at the event.